Materials: Distressed, Remnant Chenille Like Voided Velvet Fabric Front and Back. A Ribbed Chenille as Bias Welt Trim. All Cotton. Zippers. Visual, 15.5” x 15.5” approx. Description: This Set of Three Artisanaware Decorative Pillow Covers are Made From a Bolt End Remnant of Very Plush Voided Cotton Velvet Fabric. This Lovely, Earth Tone Fabric Find was Washed with a Bit of Bleach to Achieve an Olde World, Vintage Flavor. 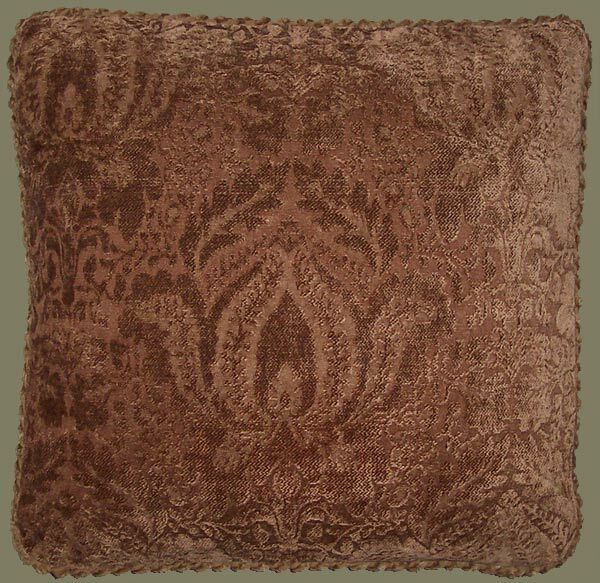 Both Sides of These Designer Pillow Covers are in the Damask Pattern Velvet, and Edges Trimmed in a Coordinating Ribbed Chenille Welt, also Washed to Achieve a Very Soft Hand. Color is a Rich Honey Brown Cinnamon. Zippers.